In Rainbows, the seventh studio album by alternative rock group Radiohead, has become available for download from their official website. The band have let fans decide what to pay for the 10 MP3 files - from nothing to £100. But they have refused to reveal how many people have ordered the album, or what they paid. Sunday's top 40 will not provide an answer, either. The band's website does not report sales to chart compilers. However, the Oxford-based band have scored number one positions for their last three studio albums - Kid A, Amnesiac and Hail To The Thief. Bryce Edge, one of the band's managers, said he had evidence that fans would be willing to pay for the album. He told BBC Radio 1's Newsbeat: "We're prepared to take a risk and we might come out looking very foolish. But we believe if your music is great, then people will pay for it." Chris Hufford, another Radiohead manager, added: "There are actually people who are going on websites and saying:, 'I don't actually like Radiohead, but I'm going to give them some money because I think it's a brilliant idea.'" 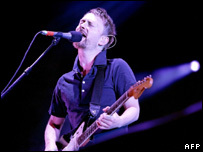 Radiohead are the latest act to circumvent the traditional routes of supplying music to their fans. Earlier this year, Prince gave away copies of his latest album, Planet Earth, with the Mail on Sunday newspaper in the UK. Genius gimmick to get them into the headlines with their new album. Indie band the Charlatans are also giving away their next album as a free download to fans who visit the website of radio station XFM. The download version of Radiohead's album contains no artwork or lyrics. The files are provided without copy protection - meaning fans can copy them to any other computer or music-playing device. A retail version is expected next year, while fans can also pre-order a £40 "discbox" from the band's website, which has extra tracks, a vinyl version of the album, and a lyric booklet as well as the download. What is Radiohead's album worth?